I sometimes think about how it must have looked to the locals of Connemara in the late 19th century to witness W.B. Yeats and Lady Gregory arrive outside their tiny thatched cottages, dressed in all their finery. There’s something comical about it. I can hear the clatter of the carriage horses, then the step down onto the plain earth by these two extraordinary personages. It must have caused an oul’ stir. It must have looked a bit like the Martians landing. The literary pair were working diligently to record as much of the folklore of the native Irish as they could because there had been a revival of interest in Irish legend. That took them out onto the open road and into the low stone huts of the plain people. 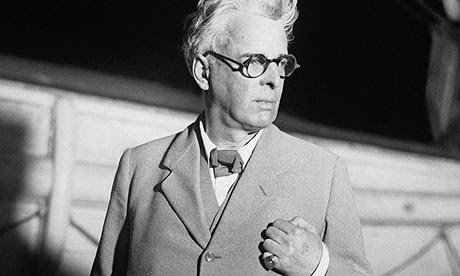 Yeats was always a striking, otherworldly figure, but at that time he was still cultivating poetic scarves, hats and flowing white linen shirts. I imagine the house-proud housewives of Galway eyeing him with that unique Irish blend of pride and complete mortification. A visit from the curate was stressful enough, but a romantic poet? It’s quite easy to imagine him sitting bolt upright in some peasant’s (he called them peasants) kitchen listening intently to the fairy tales of the Irish tradition, only stopping now and again to query the meaning of a word or reposition his pince-nez. It’s poignant to think of that lopsided exchange too, to think of the forbidding aristocrat and his even more imperious companion listening intently to some old gasur with broken teeth and bare feet telling tales of old. But Irish history is filled with glaring ironies. There was already enough irony in watching the descendents of the Plantation and Cromwell and other successive power grabs becoming infatuated with the culture their ancestors had sought to drive out. I don’t begrudge him it, though. There’s no doubt that Yeats ardently loved Ireland. He understood it in his marrow bones. The many literary nationalists (and unionists) who have sought to repartition his achievements have indulged in decades of wasted time. If you understand a nation’s myths you will understand its people. Yeats did both. Myth expresses the genius of a nation, its deepest desires, its most heartfelt aspirations. He spent his youth coming to grips with them, succeeding far beyond his contemporaries. I bring all this up because at some level Yeats and Gregory must have understood that they were working against time to save the folklore and fairy tales that were vanishing almost as fast as they could be recorded. At the time the Irish tradition was seriously facing an extinction event comparable to the one the Irish language and indeed the Irish themselves had faced in the middle of that lamentable century. So there’s something remarkable and heartening about the fact that one of the greatest poets in the English language arrived just in time to obsessively record and preserve the Irish tradition in the same century that dealt it a near fatal blow. It was a rescue mission that we as a culture still need to get to grips with in all its complexity and challenge, I suspect. Because it turns out the genius of a people and a nation can be recorded and preserved by almost anyone. Luckily for us it was a poet of Yeats’ capacity and lyric gift. It may be a coincidence of history (I personally doubt it) that Yeats’ career and reputation as poet coincided with the struggle for Irish independence. But when you think of the other groundbreaking and trans-formative Irish writers of his era like Oscar Wilde and James Joyce, you can see how uniquely in tune with the times they all were. That hasn’t always been clear to all. For decades many critics outside of Ireland have preferred to overlook the Irish details of Yeats’ life to focus on his language and achievements. In Ireland too many critics have been happy to dismiss his contributions because they came from an unexpected source -- a Protestant Anglo-Irishman with an interest in the occult and in mysticism. But Yeats is now as much a part of Ireland as Oisin and the Children of Lir and Cu Chulainn. And we’re richer for it, because the borders that partition our island could never partition his verse or his legacy. In that way we’re still learning to become his contemporaries. And it’s long since time that all of our scholars learned to accept him with the courtesy and welcome that those Connemara peasants once did.